The music lineups for Fat Mike Presents Punk In Drublic Craft Beer & Music Festival in Concord and Sacramento, CA have been announced. The Saturday, October 14 show at Concord Pavilion in Concord and the Sunday, October 15 show at Papa Murphy's Park in Sacramento will feature performances from co-headliners NOFX and Flogging Molly, along with Goldfinger, Less Than Jake, Bad Cop / Bad Cop, Get Dead, and more. Both shows are open to those 21 years old and up, and include at least 3 hours of unlimited craft beer tastings with over 100 craft beers, including some of the West Coast's best and local favorites, plus access to watch the music stage. VIP tickets include 4 hours of tastings. 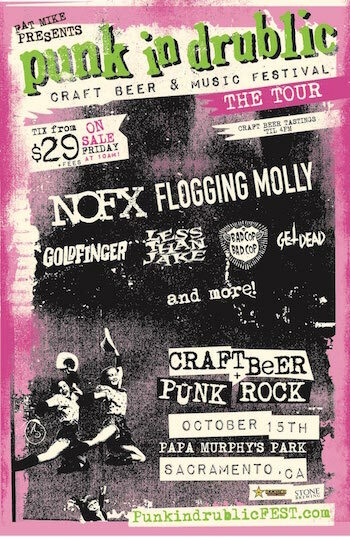 Named for NOFX's classic Punk In Drublic album, which has sold over one million copies, Punk In Drublic Craft Beer & Music Festival launches September 16 in Tacoma, WA, with stops in Boise, ID, Concord, CA, Sacramento, CA, and Huntington Beach, CA. 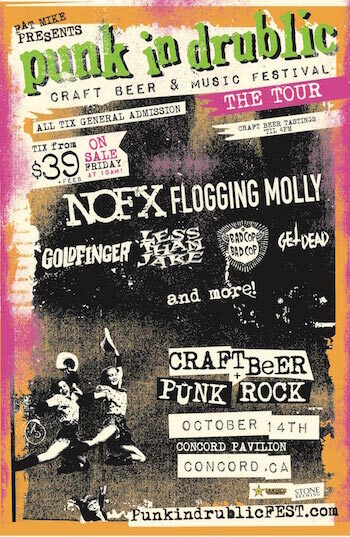 NOFX will co-headline each date of Punk In Drublic Craft Beer & Music Festival, with music lineups varying slightly by market. As previously announced, Fat Mike has joined forces with premier music event producer/promoter Synergy Global Entertainment and respected craft beer event production powerhouse Brew Ha Ha Productions for the festival. 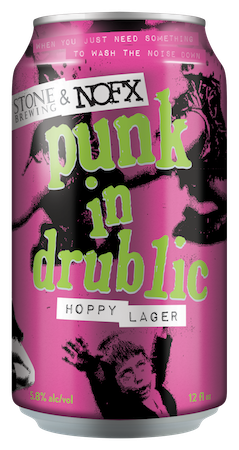 In addition, to celebrate Punk In Drublic, Fat Mike teamed up with craft beer pioneers Stone Brewing to brew their very own Stone & NOFX Punk in Drublic Hoppy Lager, which will be available in cans only in the festival markets. This collaboration is a huge show of support by Stone, as it marks the first time ever that Stone has worked with a musician for a can release. They've even included the festival tour dates on the back of each can. This is a first-of-its-kind level of commitment from a brewery partner for a festival tour.